Briar Group Inc. can provide erosion control protection during the winter months. Standard erosion control* (for slopes of 3:1 or less) contains wood fiber mulch, erosion grasses, and fertilizer. Standard slope erosion control* (for slopes of 2:1 or less) is enhanced with more wood fiber and tackifier to handle slopes. This advanced hydroseeding product is designed to replace erosion control mattings and blankets. It’s performance assures success in the most difficult sites. 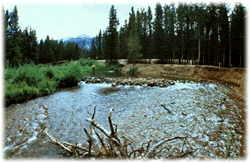 *Low-Grow Mix Option: Erosion control mixes available. Mature grow heights range from 12″ to 18′. Briar Group’s specified blend of grasses and legumes has been used successfully on many projects. Recently, the new science of including emergent wetland plants in seed form has added a new dimension. 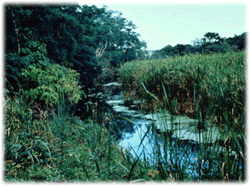 of traditional emergent wetland plantings. We are ready to assist you in both specifications and actual applications. The technology of hydroseeding wetlands has changed dramatically over the past few years. Simple grasses and legumes that tolerate wet sites are still readily available and provide an easy solution. This hydroseed mix is formulated specifically for high-profile sensitive projects along stream corridors. Our selected specification provides wet site and siltation tolerance in a blend of grasses that promote filtration and continuous water flow within the bioswale. The specification for application can be adjusted to accommodate the slope factor of sidewalls of the swale.